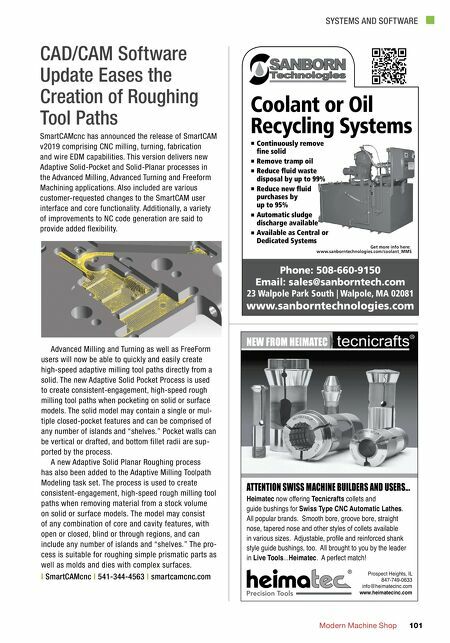 SYSTEMS AND SOFTWARE Modern Machine Shop 101 Coolant or Oil Recycling Systems Continuously remove fine solid Remove tramp oil Reduce fluid waste disposal by up to 99% Reduce new fluid purchases by up to 95% Automatic sludge discharge available Available as Central or Dedicated Systems Get more info here: www.sanborntechnologies.com/coolant_MMS Phone: 508-660-9150 Email: sales@sanborntech.com 23 Walpole Park South | Walpole, MA 02081 www.sanborntechnologies.com CAD/CAM Software Update Eases the Creation of Roughing Tool Paths SmartCAMcnc has announced the release of SmartCAM v2019 comprising CNC milling, turning, fabrication and wire EDM capabilities. This version delivers new Adaptive Solid-Pocket and Solid-Planar processes in the Advanced Milling, Advanced Turning and Freeform Machining applications. 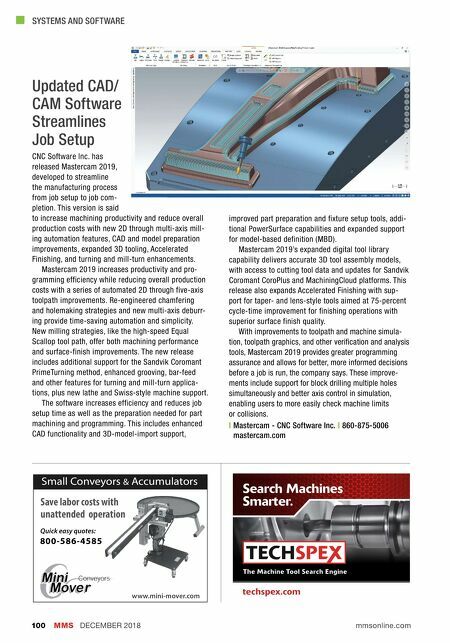 Also included are various customer-requested changes to the SmartCAM user interface and core functionality. Additionally, a variety of improvements to NC code generation are said to provide added flexibility. Advanced Milling and Turning as well as FreeForm users will now be able to quickly and easily create high-speed adaptive milling tool paths directly from a solid. The new Adaptive Solid Pocket Process is used to create consistent-engagement, high-speed rough milling tool paths when pocketing on solid or surface models. The solid model may contain a single or mul- tiple closed-pocket features and can be comprised of any number of islands and "shelves." Pocket walls can be vertical or drafted, and bottom fillet radii are sup- ported by the process. A new Adaptive Solid Planar Roughing process has also been added to the Adaptive Milling Toolpath Modeling task set. The process is used to create consistent-engagement, high-speed rough milling tool paths when removing material from a stock volume on solid or surface models. The model may consist of any combination of core and cavity features, with open or closed, blind or through regions, and can include any number of islands and "shelves." The pro- cess is suitable for roughing simple prismatic parts as well as molds and dies with complex surfaces. | SmartCAMcnc | 541-344-4563 | smartcamcnc.com NEW FROM HEIMATEC tecnicrafts R Prospect Heights, IL 847-749-0633 info@heimatecinc.com www.heimatecinc.com ATTENTION SWISS MACHINE BUILDERS AND USERS... Heimatec now offering Tecnicrafts collets and guide bushings for Swiss Type CNC Automatic Lathes. All popular brands. Smooth bore, groove bore, straight nose, tapered nose and other styles of collets available in various sizes. Adjustable, profile and reinforced shank style guide bushings, too. All brought to you by the leader in Live Tools...Heimatec. A perfect match!